Unlike most reloadable money cards, which charge so many fees that they generally present bad deals for consumers, a Bluebird account offers a card which you can use anywhere that accepts American Express but charges hardly any fees. It’s especially handy if you shop at Walmart for groceries, since you can easily transfer your Walmart SavingsCatcher funds right to your Bluebird card. The only fee I could find for using a Bluebird card is $2.50 for withdrawing funds at certain ATMs. As of this writing, Bluebird charges no fees for having the card or loading money on it. You can load money onto your Bluebird card conveniently using direct deposit of a paycheck or by using cash at a Walmart store. 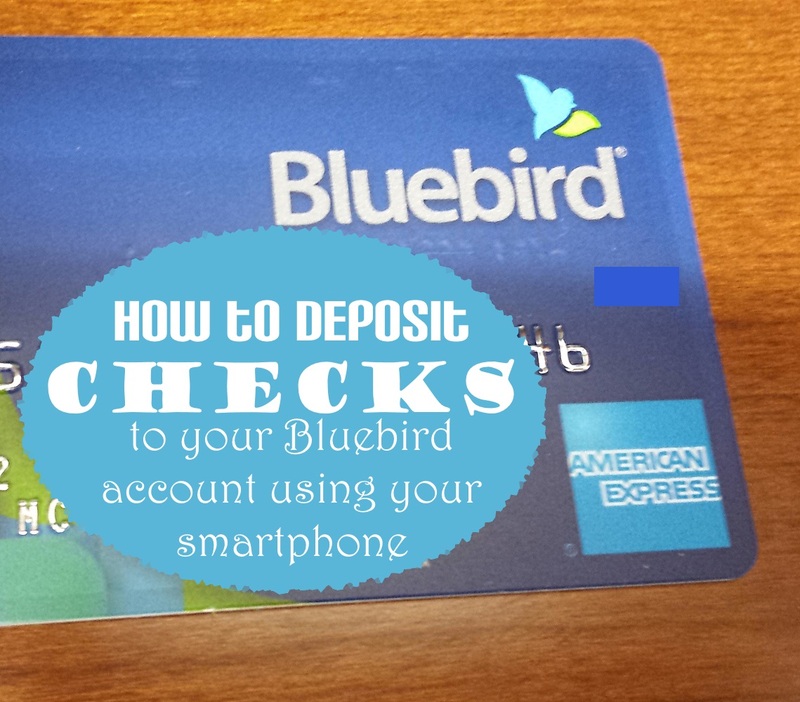 You can also make a Bluebird check deposit using the Bluebird app for iOS or Android, using these simple steps. You’ll need to have already set up an online Bluebird account linked to your Bluebird card. Download the Bluebird mobile app to your smartphone or tablet. Launch the app and login to your Bluebird account. The paper check must be made out directly to you (no third party checks), and you must sign the back of the check to properly endorse it. Touch Add Funds and Add a check. Enter the amount when prompted. Arrange the check in the view finder on a well-lit, dark surface, so that you can see all four corners of the check. It’s okay if you can see some of the area around the check. Make sure the check is sharply in focus and take the photo, then touch the checkmark. Turn over the check and sign it if you haven’t already, then have the signature on your right when you take the picture of the check’s back. Again, make sure you can see all four corners of the check in the view finder before snapping the picture, and make sure it’s well focused before selecting the checkmark. You’ll see a summary of your transaction. Make sure everything is correct, and then touch Submit. If the app asks you to re-take one of the photos, it’s probably because the photo wasn’t sharp enough, all four corners weren’t visible in the picture, you didn’t properly endorse the check or else the signature isn’t on the right in the photo of the check’s back. It took me a few tries to get everything right the first time I attempted a Bluebird check deposit. 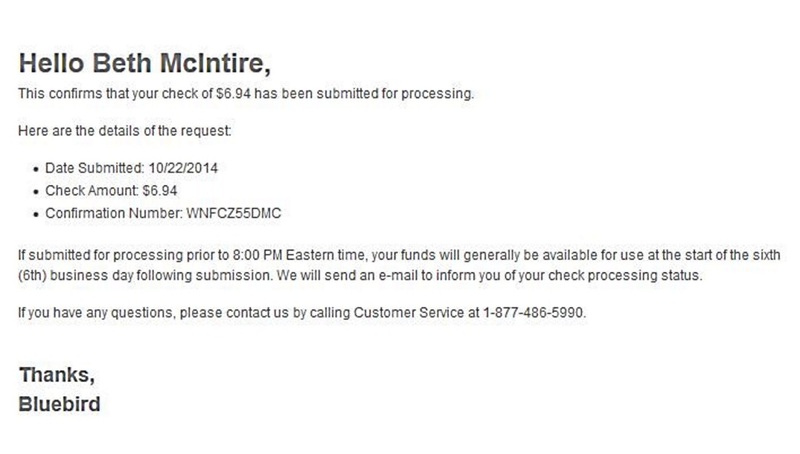 I eventually figured out the above procedure and successfully submitted two checks, both rebate checks. Who or What is Certegy Check Services? Shortly after completing my Bluebird check deposits, I received two emails regarding my transactions. One said that a Bluebird check deposit had been submitted, and the other said that the second check had been declined by their check processor, Certegy Check Services. Certegy Check Services wouldn’t tell me why they rejected my check, but I assume it’s because they see a lot of fake rebate checks. If you tend to redeem product rebate checks on a regular basis, you may have trouble depositing them using Bluebird’s mobile app and will probably have to cash or deposit the check in person at a regular bank or credit union. 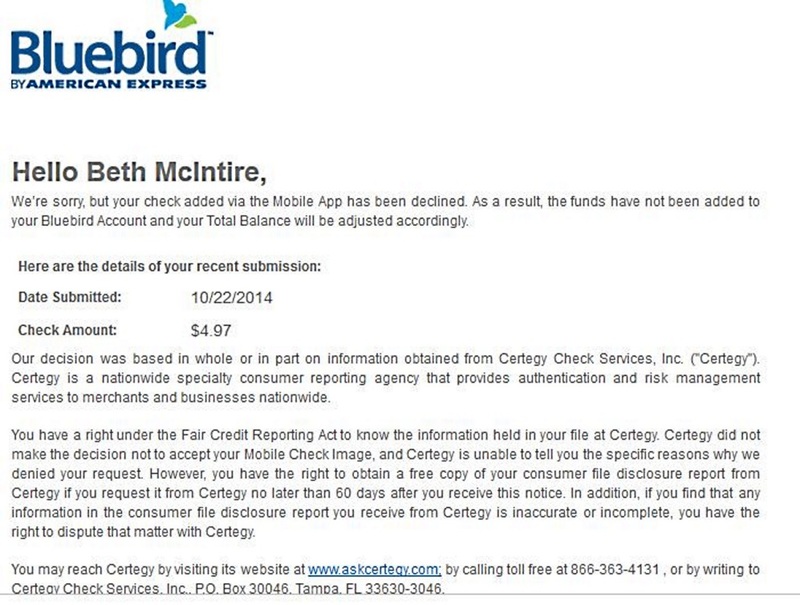 Walmart and many other stores use Certegy to decide whether to cash a particular check or accept a check for purchases. The company paid $3.5 million in 2013 to settle with the FTC over charges that the company violated the Fair Credit Reporting Act. 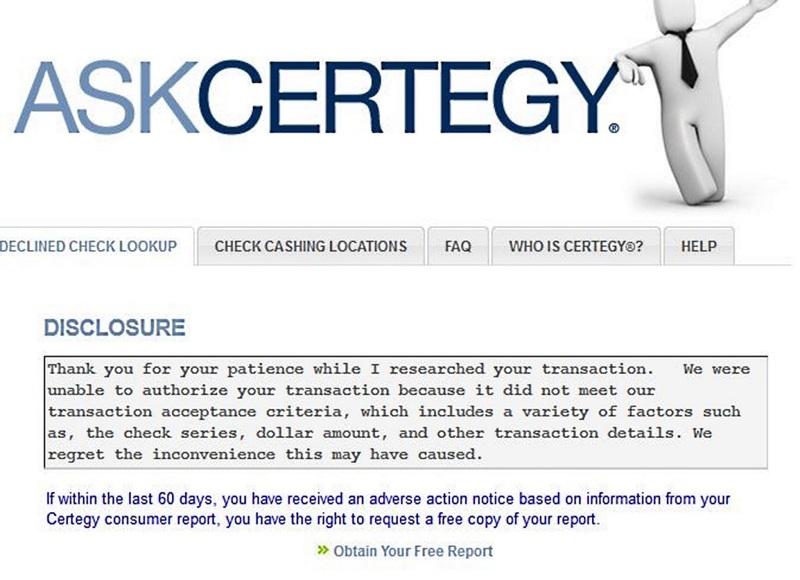 The FTC alleged that Certegy frequently maintained and reported incorrect information, which caused headaches for consumers when stores turned down their checks. Roughly a week after submitting my Bluebird check deposit, I received an email saying that the funds for the one check had been added to my Bluebird account. I’ve since deposited several checks to my Bluebird card successfully, including rebate checks. Update: Bluebird has made changes to their check deposit process. It appears that they’re using a different check servicing company. Also, funds availability can take up to 10 days unless you pay a fee for availability within minutes. You can find more information here. As an alternative to Bluebird, you might want to try a free checking account with free ATM card from CapitalOne360. This post was originally published in November 2014 and last updated in January 2017.